The ~125 million-year-old Early Cretaceous fossil beds of Los Hoyas, Spain, have long been known for producing thousands of petrified fish and reptiles (Fig. 1). However, researchers have uncovered an extremely rare, nearly complete skeleton of a hatchling bird. 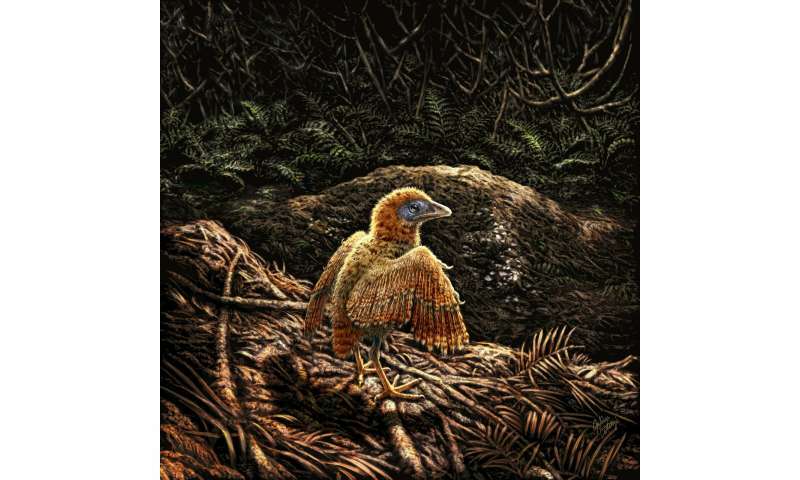 Using their own laser imaging technology, Dr. Michael Pittman from the Department of Earth Sciences at the University of Hong Kong and Thomas G Kaye from the Foundation for Scientific Advancement in the U.S. have determined the lifestyle of this ~3cm long hatchling bird by determining the previously unknown feathering preserved in the fossil specimen (Fig. 2). Chickens and ducks are "precocial," walking and foraging within hours of hatching (Fig. 3). Pigeons and eagles are "altricial," remaining in the nest and attended by their parents. Scientists have one method to determine the type for a given fossil specimen: examining the feathers. When precocial birds hatch, they have developed down feathers and partly developed large feathers, and can keep warm and move around unassisted by parents. "Previous studies searched for but failed to find any hints of feathers on the Los Hoyas hatchling. This meant that its original lifestyle was a mystery," says Dr. Pittman. Pittman and Thomas Kaye brought new technology to the study of Los Hoyas fossils in the form of a high-power laser. This made very small chemical differences in the fossils become visible by fluorescing them different colours, revealing previously unseen anatomical details. They recently had success with the first discovered fossil feather, which they disassociated from the early bird Archaeopteryx by recovering the chemical signature of its fossil quill, a key part of the feather's identification that had been previously unverified for ~150 years. The new results on the hatchling bird finally answered the question about its lifestyle, as it did, indeed, have feathers at birth (Figs. 2, 4) and was thus precocial. The feathers were made of carbon, which has low fluorescence under laser-stimulated fluorescence (LSF), but the background matrix did glow making the feathers stand out in dramatic dark silhouette (Fig. 2). 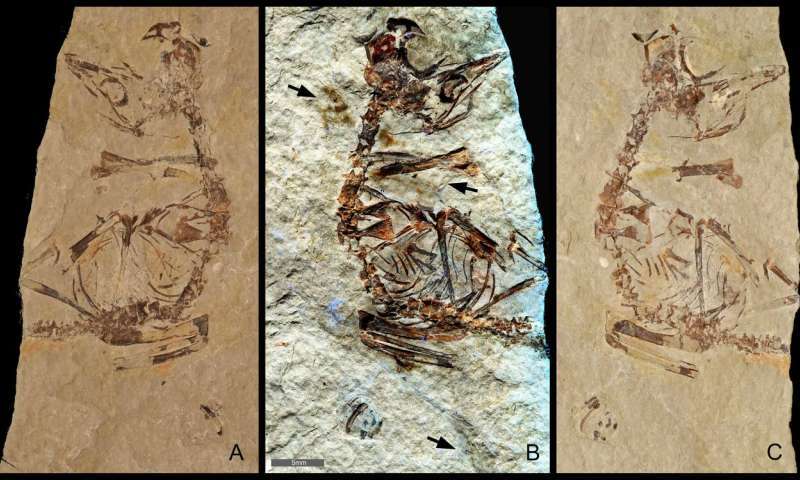 "Previous attempts using UV lights and synchrotron beams failed to detect the feathers, underscoring that the laser technology stands alone as a new tool in palaeontology," added Tom Kaye, the study's lead author. A bird hatchling leaving its nest shortly after birth ~125 million years ago. This baby bird lived in a lake environment and may have been born on the ground like some other extinct enantiornithine birds. Credit: Julius T Csotonyi / HKU Vertebrate Palaeontology Laboratory. This discovery via new technology demonstrates that some early birds adopted a precocial breeding strategy just like modern birds. Thus, in the time of the dinosaurs, some enantiornithine bird babies had the means to avoid the dangers of Mesozoic life, perhaps by following their parents or moving around themselves. "One of the feathers discovered was of a substantial size and preserves features seen in other hatchlings. It indicates that our hatchling had reasonably well-developed flight feathers at the time of birth," says Jesús Marugán-Lobón, a co-author from the Universidad Autónoma of Madrid, Spain (Figs. 2B, 4). This and other "illuminating" discoveries are adding to our knowledge of ancient life with details surviving in the fossil record that were never thought possible even a couple decades ago. 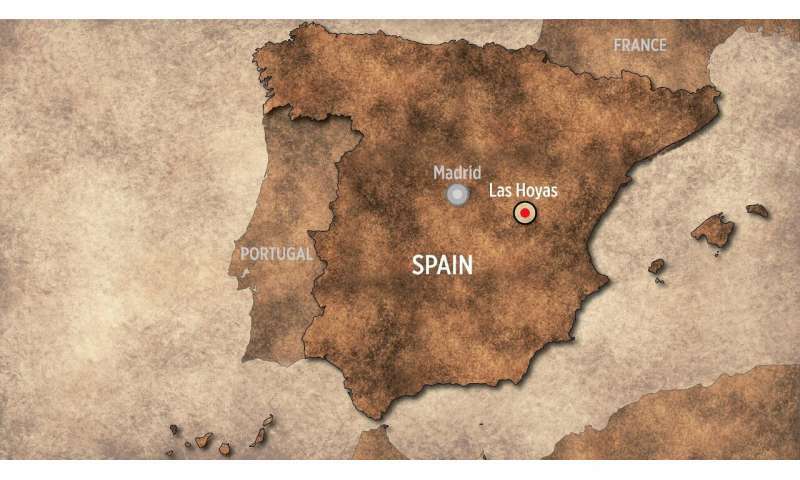 Las Hoyas, Spain is known for spectacular fossils preserved in 126+ million-year-old rocks deposited in a lake environment. Credit: HKU MOOC / HKU Vertebrate Palaeontology Laboratory.